The world is in a clever/dumb balance. For every clever thing that happens, a dumb thing happens at exactly the same time. As Ivysaur won the fourth series of PokéMole, the BBC commissioned a new series of Robin Hood. Ivysaur was the winner and Hitmonlee was the PokéMole. But which human being won the series? A bigger question than ever, now that Phil is ineligible (we both agreed this would go down as my victory). I announced last year that PokéMole 4 would never happen, but during an MSN conversation, the idea of possibly including a secret PokéMole struck me, and from then I knew I had to write it. Yet if I'm being honest, the whole idea wasn't used as well as it could have been - the end of the series especially was slightly rushed since college restraints have been greater this year than ever before. I preferred Series 3, but I still think Series 4 was a success, although not as much as it could have been. I was in two minds which PokéMole would work well this year - the quiet ones were always the most successful, as Jumpluff proved in beating Phil, but I knew that was what everybody would be looking for, and so tried to go for a PokéMole who although was quite quiet, was sometimes at the center of the trouble. Challenge 3 - In the Battle Dome challenge, Hitmonlee was knocked out straight away, although this wasn't strictly sabotage. As the diary entry in Episode 2 read, the PokéMole's plan did not work - Hitmonlee planned to stay to the end and then end the hopes of someone likely to win the challenge before losing himself, but plans do not always go to plan. Challenge 4 - Hitmonlee wastes one of the lives in the number challenge. Challenge 5 - In forcing the issue of the phone being dismantled straight away, Hitmonlee straight away takes control. It was part of a large plan of the series, to ensure Hitmonlee was always viewed as one of the most prominent members of the group. Challenge 8 - Hitmonlee was originally going to be the one who threw this challenge, but there was a huge suspicion surrounding Hitmonlee following the start of the series, and I didn't want to tilt the boat too much, so this was removed before the episode went online. Challenge 10 - Hitmonlee gets his question wrong. Challenge 11 - I just liked the name "Ready, Aim, Liar". Even I was confused by what the hell the challenge was about. Challenge 13 - Lunatone knocks over the bowl of jelly, Lunatone being the enemy dealt with by Hitmonlee. Challenge 14 - Hitmonlee takes a 50/50 gamble in the hope of winning the lower value. Challenge 15 - Hitmonlee gets knocked out and loses the challenge. Challenge 16 - Hitmonlee makes a few references to the time issue, encouraging the other contestants not to return the lost Pokéblock case. Challenge 18 - Hitmonlee loses his battle. Challenge 19 - Read the challenge carefully. Hitmonlee doesn't say one thing. Hardly helpful. Challenge 20 - Hitmonlee loses his battle, therefore leaving the other contestants with less time. Challenge 22 - Hitmonlee gets one of his questions wrong. Challenge 23 - I really wanted to write something more substantial, but couldn't be bothered. Sorry! Let's start off with the crossword, which was a sort of double bluff attempt. You were told "The PokéMole Is Male" and I was surprised by the amount of people who thought that was all there was too it, although it truth, it was. I think this sums it up the best. Secondly, the Spaghetti Junction. Yet again, I think this sums it up best - a clue as to who the secret PokéMole was. Lastly, the equation. Solve it, replacing the ??? with the number appearing on the Elimination computer in Episode 1, and you get a number, which when translated using the original key in the equation, gives you KICKER - an obvious reference to Hitmonlee. Episode 1 - 17428396158200421426 - see above. Episode 3 - 174 and 2/3 - This was a little bit unfair; when the series was written, this was the mean number of all three of Hitmonlee's Pokédex numbers before the DP information was released. Episode 5 - 2.718281828 - This number is known as "e" in mathematical terms, and Hitmonlee's codename in the same episode was "Vowel". Episode 7 - 8192 - This is a perfect number, and in the same episode, Hitmonlee was a perfection reference in one of his diary entries. 1. 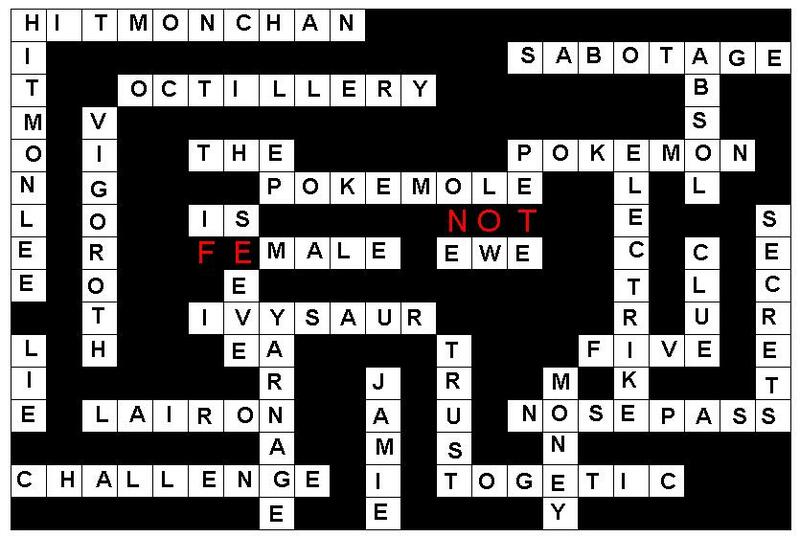 Clicking the link in my signature played some morse code to you, which translated says "The PokéMole is Hitmonlee". - The opening to Episode 5 claiming "this episode harbours one of your biggest clues"
3. The PokéMole's diary in Episode 2 claimed about Electrike: "he spent too little time concentrating and too much time chasing the ladies", hinting the PokéMole was male. 4. In Episode 7, the Presenter mentions "Fists of Fury" - a famous film which Bruce Lee appeared in, Bruce Lee being the person the name Hitmonlee is based on. "Presenter: And with that, Hitmonlee leads the way, prodding any protruding moles out of the way, to create a path through the field." Hitmonlee is prodding moles. Prodding is another word for poking. Poking Moles? PokeMoles? Come on, you have to admit that's amazing. To quote the opening of Episode 5, "Maybe youâ€™re following something you thought you picked up on in Episode One? Just make sure youâ€™re not wasting your time...". Did anybody try piecing together the first words of each episode, as was a clue last year? There is a sentence there ;). And now, the end. Will there be a PokéMole 5? The answer is this: maybe. I think I might write one one day, but not next year. PokéMole may make a return one day, but right now it's going into the cupboard.